Here is my short review of this fairly small card game, produced independently by a guy living in Indonesia, which is great because shipping is less for me in Hong Kong. It's not a big production game so don't expect anything amazing with the artwork and component quality. The cards are flimsy and I recommend sleeves to make them easier to shuffle and pickup, the art work is not too horrible for a homemade design, I like the inclusion of some Asian looking characters in the game, which is refreshing (unimportant but refreshing nevertheless.) I think the graphic design is excellent, the cards are very functional and I like how stats are kept track of and how the cards are multi-functional. I didn't have a cool model like Marco did, I just used a pink D6. The rulebook needs some mentioning first. Its not very good, its black and white (which isn't a big problem in itself, but many of the concepts of the game are in color.) and really needs a rewriting. Not everything is clear and it takes some lateral thinking to work out how the game is played. I highly recommend watching Marco's video first, it will make the rules much easier to understand. I played the game solitaire, so my review is missing the PvP aspects of the game which sounds like fun. The only thing left out of Marco's video is the placement of the event cards which I will touch on here for completeness. The event cards are separated in 4 color types and only one is ever placed on the table of each color, so there can at most be 4 event cards on the tableau and if the last event card's adventure is completed and removed, you immediately draw another card, so that there is always at least one event card on the tableau. With this little bit of knowledge and Marco's video and reading the "solo" paragraph in the rule book, you can pretty much play the game and refer to the rule book only as needed. What did I think of the game? After 8 straight games of it, the first thing that pops out at me immediately is how replayeable this game is! there are a tonne of characters to choose from and the the map placement and card draws changes each game drastically. There are also different paths to victory, you basically have to find ways to increase your stats, but there are different ways to go about this and each turn is full of decision making. You have to assess the risks of moving and doing actions, all the while keeping an eye out on your health. Its pretty hectic for a little game. Are there any faults... apart from the components and rulebook which I've mentioned I can't really find a fault, the game is very tight and well design. I wish the map was bigger so the adventure would last longer but the length as it is, is great, my games lasted about 30 minutes each (assuming I didn't die really quick). The ends were always very close and that last turn really requires some forethought and planning to win. The bottomline is I think this has a LOT more value for money than D-Day Dice (Commercial Version) which costs a lot more. I think the design for the Adventure of D is much cleverer and elegant as well. Definitely worth a try if you don't mind the theme and like a good solitaire card game that is a good puzzle with lots of decision and a decent amount of narrative. Update: Just play a couple 3 player games of this. The other 2 people weren't gamers and the down time was not good. I can imagine that if everyone knows the rules, things should be pretty quick but when you've to teach the rules to newbies the lack of "bling" and relatively long down time is a killer. Not to say it was difficult to teach, it wasn't, its just not a game for non-gamers. Probably perfect for a couple. This did let me test the multiplayer mechanics and they are sound and add to the game. I am giving this game an 7.5 out of 10. 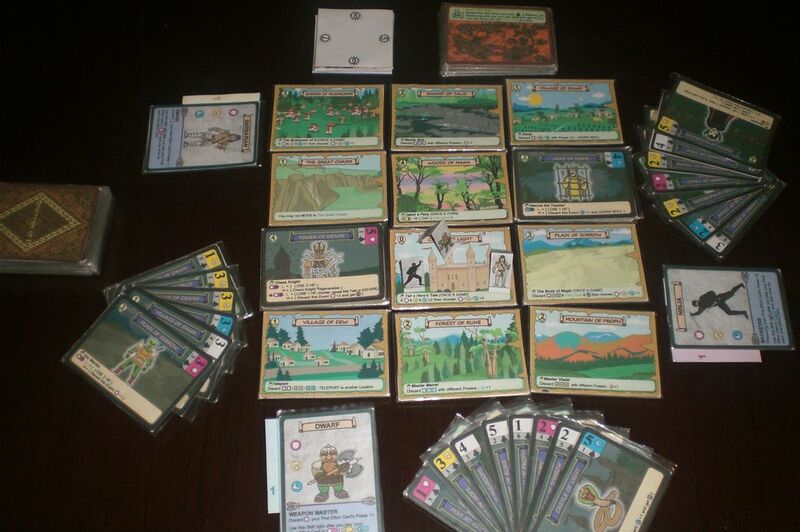 When we printed the game, we took the thickest card we can afford (one complain is that some cards have rough edges). After the game was ready we use one deck to play, until now, to test the cards endurance. I think we have played 50+ sessions, and all the cards are still in great condition. And yes, I put this warning in the Manual: play a 3 or 4 players game only if all the players are experienced. To learn the game, play with one or two players. Thanks for the review. Have you pulled the game out recently? I've just played the solo game a couple times from the May 2010 rules. But, see a cool solo variant recently posted that I want to try out. Is a new version of the manual available?